Saison brewed with oats, lime zest, lime juice and salt. Brewed and bottled at Hill Farmstead for Good Life Provisions LLC. Hugs feel great. But when you find yourself behind the wheel of a 4,000lb truck rumbling over the gravel, hugging each person you pass just isn't in the cards. So you raise your finger off the wheel just enough to acknowledge your neighbor. The Farm Wave is a completely legitmate and wholly appreciated acknowledgement. It really is the least you can do to recognize that fleeting moment you share with another person. It is simple, but meaningful. Farmer Wave exists as its own sort of acknowledgement. The brewing brought together friends separated by the evolution of life. The process was a reason to reunite and the product is a gesture from one friend to another. There are simple ways we can share our worlds with each other. Farmer Wave is one of those ways. Poured from a 1 pint 9.4 ounce bottle into a Shaker pint glass, "bottled on" date "2017 03 29". APPEARANCE: pours a beautiful, hazy straw color with two-fingers white head, excellent retention, the head slowly dissipated until a thin, unbroken layer of small bubbles remained, there is a significant amount of lacing on the glass, highly carbonated. SMELL: farmhouse funk, bread and lime. 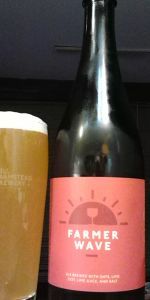 TASTE: the taste follows the nose, initially sweet lime and then farmhouse funk and bread. PALATE: medium body and highly carbonated. OVERALL: I love the Saison style but the farmhouse funk and lime was too dominant so this beer just did not work for me, I would not seek this one out again as there are other options I prefer. Lightly tart like a margarita. Slight salinity and a wonderful lime zest note even at a year and a half old. I can't imagine what it was like fresh. So dry and so refreshing. Carbonation is perfect as well. It still retains Saison-like qualities but also has the highlights of the lime and a light minerality from the salts (and that typical mineral character of HF beers.) I could crush this over and over again. 750ml bottle, dated 3.29.17, poured into a Hill Farmstead oversized wine glass. Enjoyed on 12.7.17, reviewed from Tasting Journal. The beer pours a hazy golden color, straw hues with a fizzy white head that has good retention and yields lots of soapy lace. The aroma is quite nice, tart wheat, lime zest, mineral water, light funkiness with plenty of floral character and a lingering doughy grain. The flavors are great, bright citrus juice with a nice tangy lime character that really pops with some light spice and salt, mineral water, modest funk and lingering pale grain and wildflower. The mouthfeel is good, coating medium body that is super smooth and creamy with a lightly tart and dry finish. Verdict: A very good farmhouse ale from Hill Farmstead. Nice lime character and a beautiful floral bouquet keep this beer super bright and refreshing while being nicely balanced and not overly tart or sour. Super drinkable beer.